Quiet Time Volume II is a collection of original songs and lullabies developed by music therapist Kristen Corey. Tracks 1-5 give parents and caregivers a playful way to engage and connect with babies. 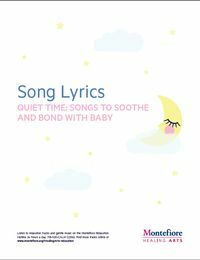 Tracks 6-10 are gentle songs to help soothe babies and put them to sleep. We invite you to play this music to help your baby relax. You can sing along as a way to share quiet time with your baby. This album is part of Healing Arts’ Quiet Time series. CDs are available in hard copy for $1.00 each. Email HealingArts@montefiore.org to place your order today. Click here to download the full booklet of song lyrics for Quiet Time Volume II. Sing along and enjoy special music time with your baby. 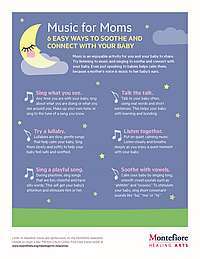 This 2-page guide provides simple tips for using music and sound to connect with your baby. The second page includes lyrics to 3 lullabies from Quiet Time Volume II. Click here to download. All music performed by Kristen Corey. Tracks 1–8: Words and music written by Kristen Corey. © 2016 Kristen Corey. All rights reserved. Licensed to Montefiore Medical Center. Not for resale. Public domain credits: Track 9 ("Twinkle, Twinkle"): traditional; origin unknown. Track 10 ("Lullaby & Goodnight"): original words and music by Johannes Brahms. New musical arrangements by Kristen Corey. Recorded by Alex DeTurk at Strange Weather Brooklyn. Special thanks to Ronit Fallek, Director, Montefiore Healing Arts Program, and baby Josef for being a part of this project.